This edition of “Where In The World Did you Find This Vegan Food” comes from Intrepid Friend Deanna C.! Deanna is one of the people who I kind of think of as something like a fun aunt to The Intrepid Herbivores. Joe and I met at an event that she had a large part in organizing, and I met her on the same day, at approximately the same moment that the germ was planted for this project. I definitely credit her activism and community organization efforts in Portland for providing opportunities for people like me to make connections, gain education and inspiration, and enjoy our city and world at large. She is also a spirit always up for adventure, having one of the most dashing travel resumes of anyone I know. She has shared with me a dish she enjoyed in Segou, Senegal. Deanna travelled to this West African republic to visit her brother who was living there as a Peace Corps volunteer. She reports that while meat and dairy are available, they are generally limited to special occasions or as something to splurge on. She says that her hosts found it a little odd that she would choose not to consume animal products if they were available, but that the hospitality she encountered was “touching” and that requesting vegan food was no problem. WHAT IS IT? Fonio with onion gravy. 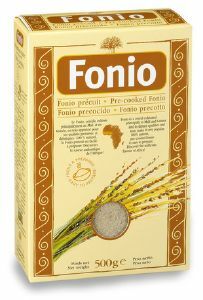 Fonio is an ancient grain, the smallest of many varieties of millet. 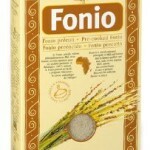 WHERE CAN I FIND IT: Fonio is cultivated in West Africa. Deanna snapped this photo at a cafe in a Peace Corps encampment in the village of Segou. Fonio is notable for being quick to grow–producing edible grain in as little as six weeks after planting and can thrive in adverse soil and crop conditions which gives it its English nickname “hungry rice.” Some West African religions refer to fonio as “the grain of life.” It is also epically nutritious! When cooked it has a texture and flavor similar to couscous. 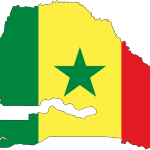 WHAT ARE SOME PHRASES TO HELP ME ORDER FOOD IN SENEGAL? There are many regional dialects throughout Senegal, but Wolof, which has some native linguistic elements as well as influence from French and Arabic, is very widely spoken, and French is recognized as the official language. WHAT’S A NON-FOOD RELATED TIP FOR WHEN I VISIT? 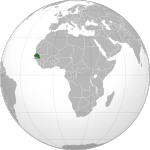 Deanna strongly suggests learning at least a little French before you go, and to expect some language barriers due to the broad variations of dialect, even amongst French and Wolof speakers. She reports that the climate is very dry and dusty, so be prepared with clothing to protect your eyes and face from blowing dust, and know that your clothes are going to get it! She also reminds us to exercise common sense and vigilance when arriving and departing to and from the airport, and if anyone helps you with your bag or does anything for you there, you will owe them money for their assistance. However, don’t be intimidated by unwanted attention at the airport. She reports that once away from there, the people she encountered were, in her experience, hospitable and helpful. 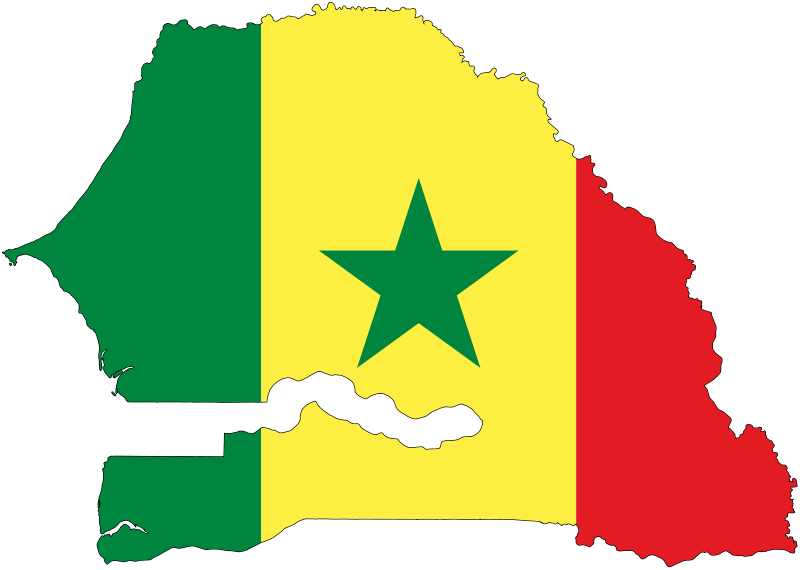 THAT DISH LOOKS AWESOME, BUT IT WILL BE A WHILE TIL I CAN VISIT SENEGAL. HOW CAN I MAKE THIS AT HOME? My research suggests that fonio is actually rather difficult to obtain in the US. I see allusions to relative ease of buying it at health food stores in Europe, however I would be inclined to stop and think about where it came from. If it was grown in West Africa and exported, I would like to know how it was obtained and whether the farmers were paid a fair wage or if they were forced to cater to, well, western “health food” eaters at the expense of their own livelihood. In lieu of access to locally grown fonio I suggest playing with couscous or millet as a delicious substitute. 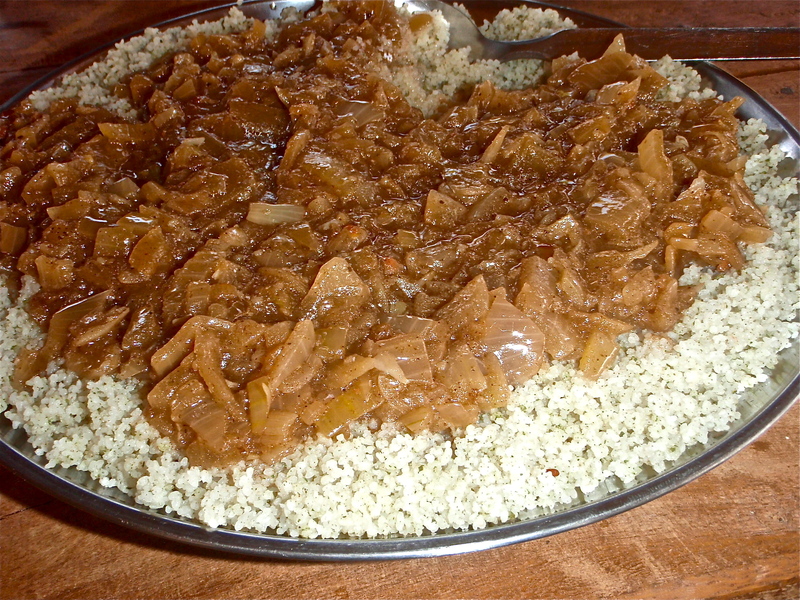 And as for that tasty-looking onion sauce in Deanna’s photo, there are many variations of West African onion dishes, often called “yassa” and made with mustard as well as fried onions. My favorite that I’ve found features seitan and is by Linda at Lindas Liv I Sverige (an interesting blog that takes on the topic of international vegetarianism with some great recipes and and an individual cultural perspective). I have not yet visited West Africa and hearing about some of Deanna’s experiences there has only increased my curiosity. I feel it’s likely that westerners (speaking as someone who grew up and lives in the United States) have a lot of conceptions about this region which may or may not be accurate. When I think of that part of Africa I think of scarcity and harsh conditions. I know very little about the culture and customs and actual way of life, and what I have learned is filtered through someone else’s experience or writings. It strikes me, talking to Deanna, that she is very fortunate to have had the opportunity to catch a glimpse of a world that seems so very far away from the one that she and I know. But the fact that she reports such genuine hospitality and kindness from her hosts gives me a kind of inspiration. For her–and by extension of imagination, myself–to be a woman from across the world, from a world where we can take more comfort and privilege for granted with our little fingers than many people in such impoverished regions can likely see in a lifetime, and be met not with distrust, resentment or hostility but rather with open hearts and generosity, goes against so many logical aspects of our consumer-based culture. It strikes me as a gift to be welcomed into the other side of that extreme, even for a brief visit, to share a few meals, learn even a little bit about the way of daily life for normal people in a very different culture, and challenge your priorities of what is meaningful to you at home. I hope I get the opportunity to experience this someday. What I would do if I were in a remote African village and my hosts would be mortally offended if I refused to eat the goat they had slaughtered in my honor as their guest? By choosing to be vegan, and advocating for veganism, am I trying to say that impoverished farmers in third-world countries should allow their children to starve rather than slaughtering the chickens they raised if that was what they were able to grow in their conditions? To the first question, I really honestly do not know what I would do if it were sprung on me all of a sudden–for instance, if I stepped into a little gap in the space/time continuum and I found myself in a remote African village without warning, and had no way to discuss food customs before I arrived and they had already jumped and killed the goat the millisecond that time/space bubble (which apparently transported me there somehow) materialized on the outskirts of their town. But it’s far more likely that when I do go visit a village such as this, it will not be without context and I will be able to do something similar to what Deanna did. She reports that her brother, who had been living in Senegal for some time, communicated to the villagers ahead of time that she is vegan and their mom is vegetarian, so their hosts were well prepared and it was not a problem. While she says their hosts considered it odd that they would CHOOSE not to eat meat if it was available and being offered, it doesn’t sound like anyone was offended or took her and her mom’s request personally. Veganism can be said to be a choice afforded out of privilege, and to some it can seem like an elitist stance to attempt to hold to your own ideals when you are outside of your own home. But what is not always accounted for in this argument is that hosts want to be good hosts–and a good host is often respectful of their guest’s ideological values and do not take them personally. It is a fallacy to imply that simply because someone hasn’t encountered a vegan before automatically means that they are against veganism or find the idea offensive. It can be surprising how flexible people will be when you are gracious, understanding, proactive and communicative about your needs–you will help them make you comfortable, which is something that most hosts will appreciate (I know I am always grateful for such communication when I host people coming into my home with special dietary or physical needs). And in general, respectfully requesting not to consume a share of the most expensively acquired ingredient in a relatively scarce food supply is not going to be a bad thing. So regarding the second question of the farm family and their chickens–this is a bit more of a squishy grey area. Do I think the chicken’s life has value and the chicken has a right to live that life free of pain, suffering, fear and untimely death? Yes, I do. Do I think the theoretic poor farmer’s children have the same right? Of course. Do I understand that this family does not have all of the options available to them that I do? Yes. Does my choosing not to eat chickens or their products, and advocate for our food chain to consume fewer chickens, affect that farmer and her children? Of course not. Because I have that privilege–and it is a privilege I acknowledge every day–of being able to make choices, from an incredibly broad swath of options, about what I eat, I feel I have a responsibility to eat in a way that causes the least harm possible. My choice not to eat chickens and other creatures, or support systems that exploit them, is the best I can do in my situation. Worldwide it is those of us with privilege who are able to cause the most harm. And to wrap up what turned into a very lengthy and thought-provoking write-up for me, I have to ask: Where in the world have YOU discovered awesome vegan food? Send me your photo and it could be featured in an upcoming post! This entry was posted on July 11, 2013 by sadie in Uncategorized.